The Star’s Ben Spurr reports that the Glen Andrews Community Association in Scarborough has proposed yet another variant on the Scarborough Subway, and that this is supported by Councillor Glenn De Baeremaeker and provincial Minister (and former Councillor) Brad Duguid. City Planning staff are already engaged in reviewing this proposal without any direction to do so from Council, according to Spurr’s article. The scheme, nicknamed the “Big Bend” would enter Scarborough Town Centre on an east-west axis rather than the north-south route proposed by the TTC. It would veer east at Ellesmere and then make a wide turn bringing the route under the existing RT through the STC station area and continue to vacant space on the east side of Brimley. This open area would be used as the staging area for the tunnel construction akin to the sites on the Crosstown project at Black Creek and at Brentcliffe. This would avoid creation of a staging area for the subway tunnel near Ellesmere and McCowan and limit the need to expropriate lands for the subway and a new station, but it would also leave the subway aligned in a way that would allow eventual westward extension to link with the Sheppard line. Although this has been reported simply as a revised alignment, much more is involved in this proposal. Instead of twin tunnels, the TTC’s typical construction method, a single 12m to 13m bore would be used, one that could accommodate station structures within the tunnel and eliminate (or at least reduce) the need for surface excavation such as we have seen on the TYSSE station projects. The technical side of this scheme was put forward by Michael Schatz, Managing Director of engineering company Hatch (a portion of the former Hatch Mott Macdonald) which shows up from time to time as a consultant to the TTC and GO Transit. Whether this is an official company proposal, or a personal scheme, or some sort of “business development”, is hard to say. There is no reference to this proposal on the company’s website. As for the politicians, De Baeremaeker in Council and Duguid behind the scenes at Queen’s Park have been meddling in the LRT/subway debate for some time. De Baeremaeker’s initial motivation appeared to be avoiding an election attack by a Ford stand-in challenging his dedication to Scarborough’s manifest subway destiny. Duguid’s role raises questions about who sets transportation policy in Kathleen Wynne’s government and just how much real commitment there is to any of the LRT schemes in Toronto beyond the Crosstown project now under construction. This is not simply a case of looking at an alternative design for the STC area, but of reviewing the entire line. The larger tunnel would be dug at a different elevation, and the manner in which it would link to the existing structure at Kennedy, not to mention how it will co-exist with the planned eastern extension of the Crosstown LRT, must be worked out. Terminal operations for a pair of stacked platforms at STC also need to be designed if the TTC intends to run all service through to that point. This represents a considerable delay. It was intriguing that GDB did not mention this proposal at today’s TTC meeting and in fact held to the idea of getting politics out of the way and letting the project proceed. And at the end of all this we have a ‘dead end’ subway. A subway that can never be extended to the east if/when demand justified an extension to Centennial College or Malvern or U of T.
A subway that City Planners say ‘should not’ be extended north to the Sheppard. It is self evident that if the subway is going to Agincourt and Don Mills, it is most certainly not going to Centennial College, Malvern or UofT. There may be Scarborough Subway Champions now at Queen’s Park (the Liberal’s Mitzie Hunter and the Tory’s Raymond Cho), but the proposed Big Bend line will never come near their ridings in eastern Scarborough. The Sheppard connection proposal has been around for years, and is a leftover from Rob Ford’s mayoral campaign. De Baeremaeker’s recent comments disparaging the Relief Line take on a new meaning in the context of a politician looking to plunder the capital budget to suit his own ends. It is quite clear that with this outlook, the Sheppard LRT will never be built even though it still appears on official provincial maps. So much for Queen’s Park’s “commitment” to eastern Scarborough. The single bore tunnel will be quite deep both for structural reasons related to its size and to stay out of the way of utilities. At STC station, the idea is that a deep station would be built within the tunnel under the existing bus loop thereby avoiding the need for a completely new terminal. However, the vertical difference would pose a transfer time penalty, an amusing situation when one considers the scorn heaped on the design of Kennedy Station’s SRT to subway link. The tunnel option is presented as one that could proceed without the surface disruptions of conventional subway construction as practiced by the TTC. This is not entirely true. Similarly, if Lawrence East Station reappears, as the Community Association proposes, it will require access shafts from the surface down to the station. This is a difficult location because Highland Creek crosses McCowan here, but stations below the water table are not unheard of even in Toronto (see York Mills and Queens Quay for examples, although the latter is comparatively shallow). The press release argues that a Lawrence East Station would be cheaper with the single tunnel scheme than with a standard TTC cut-and-cover structure, but the real question is how much this station would add to the cost of a project which does not now include it. Emergency exit shafts are required roughly between stations. Construction activity for one of these can be seen along Eglinton such as at Petman (east of Mt. Pleasant) where the access is dug down from the surface to tunnels that have already been built below the street. Just because there are no stations from Kennedy to STC does not mean that the space between them will be free of construction effects. At STC, assuming that the existing bus terminal can remain in operation, there would be a saving on building its replacement. However, this is only one part of a more complex comparison that must be performed between the current TTC proposal’s design and whatever might develop from the Big Bend option. One cannot assume a “saving” until the relative cost and components of the two schemes are worked out. The Community Association proposes that the tunnel launch site use existing green space on the west side of STC beside Brimley Road. By comparison with the sites on Eglinton at Black Creek and at Brentcliffe, this may not be large enough (especially considering its “long” dimension runs north-south), but that could be dealt with by temporarily closing an adjacent road and expanding into the existing parking lot. No need for a temporary bus terminal. No need to buy a fleet of buses to carry SRT passengers. Whether a temporary terminal can be avoided while construction of the links to a new station below it is underway remains to be seen. As for a fleet of buses for SRT passengers, that has nothing to do with the subway plan at all, unless the subway is built in the SRT corridor, an alignment the TTC has already rejected for other reasons. It is ironic that this scheme only became possible once the City decided it could not afford to take the subway to Sheppard and cut the line back to STC. If there really were a desire to serve the area north of Highway 401 and east of STC, the subway would have gone there. Instead we are back to the Sheppard hookup proposal. If Council really wants to reopen the entire debate, they need to be honest about what this will cost in time and dollars. Unless there is a change in funding from Ottawa and Queen’s Park, their contributions are fixed and any new costs are entirely on the City’s account. How many more years of the 1.6% Scarborough Subway Tax will be needed to pay for this? How will the return of the Sheppard Subway Extensions to the political field affect priorities for spending elsewhere in the City? How many more Councillors will cry that their wards “deserve” a subway? Muddled into all of this is the status of SmartTrack which even though the brand name remains in use is really nothing more than a few local stops added to GO’s RER plans. Toronto will have to decide before the end of November (a Metrolinx imposed deadline) just how much it will shell out for additional “SmartTrack” infrastructure. Councillors are quick to complain that transit project costs rise uncontrollably, but faced with the need to settle on a design so that it can be costed to a reliable level for budgets and construction, continue to pursue alternatives. No doubt the Big Bend proponents will want a cost estimate for their scheme in months so that a formal decision can be made. If De Baeremaeker, Duguid and Tory have already decided that the Big Bend is the only scheme that will be acceptable, then the whole process of past years has been a sham. It is entirely possible that the Eglinton East LRT, the sweetener added to the Scarborough transit plan to make the subway more palatable, will simply fall off of the map and the money will all go to the subway project. This would be a brutal “bait and switch” for eastern Scarborough, but it would show the true colours of their “subway champions”. This entry was posted in A Grand Plan, Scarborough RT/LRT/Subway. Bookmark the permalink. Steve wrote: It is quite clear that with this outlook, the Sheppard LRT will never be built even though it still appears on official provincial maps. With other things occupying my time over the weekend, I didn’t get a chance to look at this “Big Bend” issue until today (Nov 1), but it meshes with something I noticed in the news coverage on Monday regarding the provincial/city funding of several projects. What caught my attention was the mention of the Sheppard LRT, but when I saw the map that was being shown, it was clear that the west end of the Sheppard LRT was where it connected with SmartTrack at Agincourt station. This made me think that the idea of a Sheppard subway to STC was still on someone’s mind, and when I read the “Big Bend” proposal, that appears to be true. Steve: See p14 of the City Manager’s presentation to Exec today. The Sheppard LRT goes to Don Mills Station. City Planning Staff advised Council they did not want it extended north to Sheppard because that would take potential office development away from Scarborough Centre. Is it just me? This sounds ludicrous, and maybe even a huge misappropriation of resources. Is it the real reason for a Line 2 extension being favoured over a Sheppard extension? Steve: If this is really what is happening, then it is clear that STC is being force fed in the hope that it will someday attract development. Never mind what might be a better network for riders. If I were a conspiracy theorist, I would think the politicians were purposely delaying the Scarborough subway extension and running up its cost to the point of absurdity so that they could justify cancelling it later on. Bombardier would then apologize for its late streetcar deliveries by suggesting that it could give a good deal on some SRT replacement vehicles. And the province would announce that it’s studying an extension of the Sheppard subway to Victoria Park as a prelude to the Sheppard LRT, but, hey, maybe that could be a subway too. Then, there would be another election, and all the politicians would be free from their earlier promises. Of course, it’s more likely that the politicians are just being silly. Honestly, who in the world do they think will want to ride the Bloor subway in a silly loop like that to Kennedy and Sheppard? It would be cheaper to just increase the frequency on the RER. The media just cant help itself with the ongoing divisive mockery and rhetoric. People just dont get why we have divisive politicians to represent those without a voice being mocked by the media which represents those in the areas of subways and fancy transit land. This subway extension make more sense the Vaughan but not a peep. Keep up the good fight. Steve: I agree, and thought that Mallick’s article was not at all helpful in this “conversation”. I could have sworn that the original plan for the Sheppard Subway was to have it go from Downsview Station to the STC. So I continue to ask, why line 2? Steve: Once upon a time, that was the idea for Sheppard, but the outer ends proved too rich for our budgets and for their likely demand. What seems to be happening now is that the Sheppard subway boosters are making common cause with the Scarborough boosters to get one big subway, at least as this decade’s pipedream transit plan. I was starting to think the same thought. But the end result of an ongoing delay will just gift wrap fuel and possibly hand the next Mayoral seat to Doug Ford or another polarizing figure.. I believe they actually really need to wrap the SSE route up, move on and likely fund the Eglinton Crosstown extension with Sheppard under review before the next election campaign begins otherwise I wouldn’t be shocked to see a Ford back in the hunt and this put him over the top. There are multiple needs and those two lines cover a large portion to gain guaranteed majority support out here. I have had the (mis)fortune of needing to go from STC to Sheppard subway along with a multitude of other sardines. I had previously envisioned connecting the DMRL (Don Mills – Relief Line) to Sheppard, but there are alignment problems at the proposed junction. 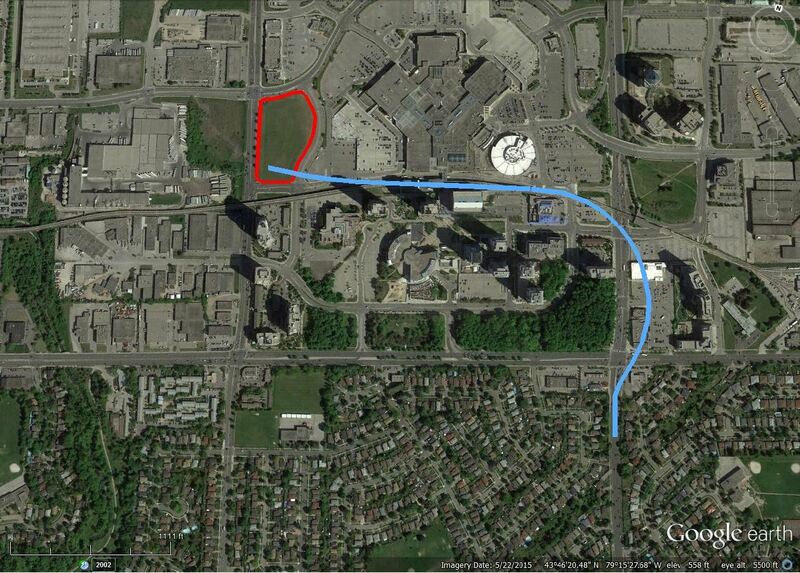 Furthermore, it is difficult to justify a subway from Don Mills & Eglinton to Don Mills & Sheppard. As subways go, I still think that the DMRL from downtown to Eglinton ought to be top priority, and it needs to be expedited and funded at the soonest. Unfortunately, the politicians do not see votes and re-election from the DMRL, only from the SSE, and also SmartTrack. Nobody at Queens Park is championing it. I also support the idea of upgrading the SRT to LRT, not closing it down forever, and to keep the route open and eventually extend it. Because the LRT power source is overhead, an LRT can operate on the street, no power rails at ground level. Queens Park was onside, but then the idea became redefined as “SRT vs SSE”, a zero sum game. This SSE idea is quite compatible with SRT, both can co-exist. I also support extending an LRT network throughout Scarborough. And everywhere else. Especially to Bolton. I do not like the Fordian idea that subway networks and LRT networks are competing with each other. Each has their proper place in good public transit, both need expansion, though politics and financing priorities get in the way. I am not expert enough to say how the SSE should be built, if a single extra-wide bore tunnel is the proper way to go, though I can appreciate the implications, as Steve has pointed out in much detail. I am thinking that connecting SSE to Sheppard makes good sense for operations. Both are lower volume lines, so they can operate on a different headway and shorter trainsets than the existing Bloor-Danforth line. In other words, though the tracks are connected, they remain separate routes. But the Joker is, how is Toronto going to pay for this as well as the SmartTrack, hmmm? Mayor John Tory has repeatedly said that transit needs to be built (albeit as he sees fit), enough talk, let’s go! No matter how they are dealt, tax increases are in the cards. Call me naïve, but I figured that with the SSE to STC, it was the final nail in the coffin for a Sheppard subway extension to STC (at least in our lifetime). If it’s hard enough now to justify one subway extension to STC, why on earth would we build two? Oh wait, this is Toronto, where we build subways for political purposes instead of actual demand. With the SSE pointing west at it’s newly proposed termination point, I now fear that the STC area and Scarborough in general will continue to dominate our transit “planning”, much to the detriment of other badly needed projects like the DRL. It’s ironic that a “downtown” relief line would help commuters from Scarborough a lot more that the current plans for the SSE, which do nothing but funnel them onto already packed Yonge trains. But don’t bother telling this to anyone in Scarborough, they’ll just say that downtown has enough subways already. Enough with the DRL will help Scarborough “a lot more” nonsense. Scarborough doesn’t have a public transit system worth using. Transfer City had some merits and what was good is still being discussed or built. Its not as simple as LRT vs Subway. Its about building an integrated intelligent network based on what exists. If we add the SSE, Eglinton Crosstown extension then many more people here will care about the DRL. If people spent less time trying to fight to hack in Scarborough Center with transfers we could move on. This fight has been overblow and not do anything for City integration or moving the City forward. I was hopeful the latest study would promote running the SSE partially above ground on the current RT line to extend it to Sheppard. But given the latest McCowan route being supported by the Province and local Council im sure that is not happening. But well find out next month hopefully. So unfortunately I don’t see much Sheppard LRT support whatsoever unless we extend the SSE to Sheppard which would probably end up being a cheaper option. Here is a way to tie Sheppard LRT, SSE cancellation, DRL, Liberty Village, UPX, Yonge/Bloor, overwhelmed Union Station and LRT in one package. Steve: There’s a reason that thread is called “transit fantasy maps”. Several people here have expressed a conspiracy to artificially inflate the Scarborough subway cost so much as to use it as a pretext to cancel it but I remain convinced that our man Tory will deliver it. Also if a one stop subway is going to cost as the artificial inflaters want to say 5 billion, then it follows that a 10 stop Downtown Relief Line might cost ten times as much to around 50 billion (now, I know that it’s not as simple and the cost depends on much more than just the number of stations but more or less as a rough estimate). Steve: A $5 billion pricetag is definitely inflated, but I would not be surprised to see the number higher than originally projected as the challenges to construct the line have turned out to be more complex than thought. The cost is less a function of the number of stations than of the length. Some of the originally proposed stations in Scarborough would be quite expensive due to their depth and local conditions, although the same can be said for some DRL stations, but not all of them. @Jimmy Agreed, you will here barely hear or read a peep Metroland or the Toronto Star when the DRL phase 1 costs double or triple. It likely won’t even be scrutinized much. The SSE will probably be the only major project we’ll EVER see that will have real numbers attached prior and come in on budget due to the polarizing City’s Left Medias never ending obsession to kill it. My inside voice tells me that Liberal Premier Kathleen Wynne will cancel the Scarborough subway immediately after winning the 2018 election much like Liberal Premier Dalton McGuinty cancelled his promise to bury the Scarborough portion of the Eglinton Crosstown LRT as soon as he won the election in 2011. There is very little power in the hands of Scarborough politicians whether it be at the municipal, provincial, or federal level which explains the dismal state of not just transit but also other public infrastructure and services in Scarborough as compared to Downtown Toronto. As an example consider this: there are too many sidewalks in Downtown Toronto that are made out of expensive granite and on the other hand, you won’t find even one ounce of granite on any sidewalk in Scarborough. On the other hand, my street in Scarborough has concrete cut out repeatedly by the telecommunications companies only to be refilled with asphalt and there are so many concrete sidewalks irregularly mixed with asphalt here and there in Scarborough but I can’t find a single example of such outrage anywhere in Downtown Toronto. My Scarborough street and neighbourhood has not had a decent sidewalk in many years (only concrete irregularly mixed with asphalt here and there). THE GREAT COMPROMISE: I would be willing to accept LRT over the subway in Scarborough if we too can get granite sidewalks like so many streets in Downtown Toronto: Bloor St West, Queens Quay, and not to mention so many streets in the financial district. Steve: I am constantly amazed that you continue to post under a variety of names, but your style and arguments do not change. The granite sidewalks on Bloor Street (and in nearby Yorkville) are paved in granite because the local businesses paid for the upgrade. In the financial district, a lot of the granite is in the private plazas of the towers, and this extends into the public sidewalk as a joint project with the city where the property owners pay for the upgrade as part the overall “look” of their properties. Queens Quay was built in granite as a public area with public funds as part of this waterfront showcase. Extensions into private lands were paid for by businesses and condos. All of these areas see pedestrian (and tourist) traffic at a level Scarborough does not, and indeed not seen in much of the old City of Toronto either. There are pavement cuts by utilities all over the place downtown, and they pay for the repairs (as they do in the suburbs). Indeed, the city charges more to repair cuts in roads and sidewalks that have been recently rebuilt, and encourages co-ordination of utility work with major construction projects. Some companies are better at other than handling this co-ordination, and simply regard whatever fee the city charges as part of the cost of doing business. It is standard to let a cut stay for a year with a temporary patch after it has been made so that the ground will settle at the excavation before a permanent repair. Downtown. a lot of the utilities run under the curb lane of roads, and so the cuts tend to be moreso in roads than sidewalks, but the latter do happen when needed. If you have a problem with the quality of your local sidewalk, you should complain to your councillor, unless they are so busy buying votes with subway plans that they don’t care about small scale amenities like that. Conversely, if your support for LRT can be bought off with granite sidewalks, we should start cutting the blocks to pave every inch of Scarborough. It will still be cheaper than billions wasted on the subway. Steve said: The cost is less a function of the number of stations than of the length. My lick-and-a-promise calculations have three parts: fixed costs, a distance-based price per km, and a station-based price per square meter. For example, the difference between the 3-stop $3.48B vs. 10-stop $1.99B versions of the SSE would be $500M for 1.7km of tunnel, $300M for crossing the 401, $150M per station, and $400M low-balling the difference. Using the same rough technique, an 18km DRL would cost $1.5B fixed start-up + $5.5B tunnel + $1.5B stations + $3.5B contingency for a price of $12B. Steve: For what it’s worth, when the TTC was asked to break down their cost estimates for Scarborough, here is what they came up with. “Adam”, Scarbourough should just leave the City of Toronto and go its own way. Then you will have all the granite sidewalks and subways you need. In a Perfect World the Scarborough subway was built and there was no red tape or LRT debate and the TTC was able to get on to build the downtown relief line and everybody was happy. Steve: Perfect is a relative term. A Scarborough Subway absent the rest of the LRT network is not a “perfect” network for Scarborough. Adam says: My inside voice tells me that Liberal Premier Kathleen Wynne will cancel the Scarborough subway immediately after winning the 2018 election much like Liberal Premier Dalton McGuinty cancelled his promise to bury the Scarborough portion of the Eglinton Crosstown LRT as soon as he won the election in 2011. I can count 4 errors in that sentence. 1. Wynne is at 15% support and is highly unlikely to win. 2. That Wynne would cancel the subway. She may convince the left on Concil to demand that it may be cancelled, but she would never do it herself and dare upsetting MP Duguid and the Scarborough Liberal caucus. 3. That McGuinty promised to bury the Scarborough portion of the ECLRT. This was not an election promise, it was forced on him by Mayor Ford. 4. That is was cancelled after the 2011 election. It was actually cancelled in 2012 when he sensed that Ford was weakening and he could knock him down a few pegs. Ed: “Adam”, Scarbourough should just leave the City of Toronto and go its own way. Then you will have all the granite sidewalks and subways you need. This comment is everything wrong with this City. Scarborough Center isn’t asking for anything others key areas of the City don’t already have. Yet this is the polarizing BS comment that gets slung. We need to build bridges based on what exists and stop this insane divisive rhetoric. Nobody needs to leave. People need to learn to work together. Steve: But I must repeat that the majority of the comments about downtown and granite sidewalks betrayed that the writer did not know why most of them are there, and not as civic projects. So de-polarization needs to occur on both sides of Victoria Park Ave.
Joe M said: Scarborough Center isn’t asking for anything others key areas of the City don’t already have. We need to take the jealousy out of transit planning as well. Etobicoke Civic Centre doesn’t have a subway stop (Kipling is 3.5km). York Civic Centre is getting LRT. East York Civic Centre is 1km from Coxwell Station. Are these not “other key areas of the City” or are there more subway extensions in the works?